This little used railway line near Calvert in Buckinghamshire, is a vestige of the Varsity Line that used to run between Oxford and Cambridge. The Great Central Railway between London, Nottingham and Sheffield also used to cross over this line just before the road bridge, but that line was also closed and dismantled. But by 2017, the old Varsity track will be replaced by the East-West rail line between Oxford and Bedford, and by 2026, at this spot, HS2 will be diving under the new line and along the route of the Great Central Railway. 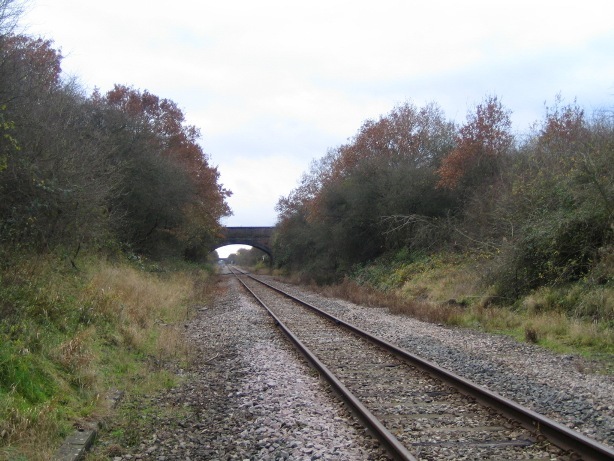 This is a very ordinary picture of a railway line near the village of Calvert in Buckinghamshire looking west towards Bicester in Oxfordshire. The line is used only by freight trains, currently one a day, carrying containerised household waste from Bath and Bristol, known as the ‘Avon Binliner’, to the nearby landfill site at Calvert, one of the largest in the country. This single track is all that remains of the once double tracked Oxford to Bletchley railway that was constructed by the Buckinghamshire Railway Company and which opened on 1 October 1850. The line later formed part of a cross-country line from Oxford via Bletchley and Bedford, to Cambridge, which came to be known as the Varsity Line. 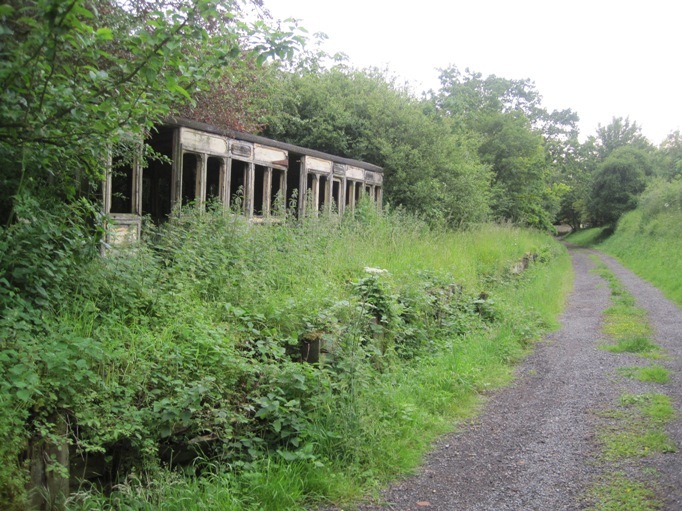 Although not listed in the original Beeching report, the line was closed to passengers at the end of 1967 with much of the line mothballed, though not dismantled. The reinstatement of the line was first promoted by the East West Rail Consortium of local authorities and businesses in 1995, but this was rejected by the Strategic Rail Authority in 2001. Efforts to have the line re-opened continued for the next ten years, with innumerable reports prepared and cost-benefit surveys carried out. 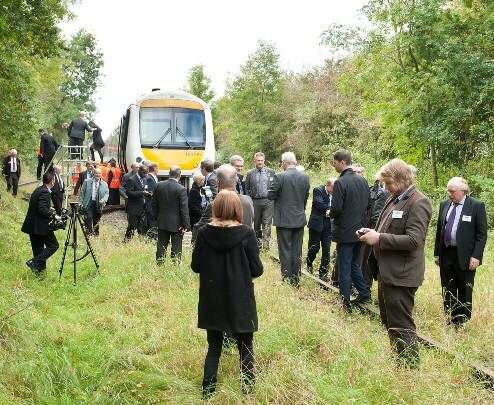 The East-West Rail Consortium organised a site visit in October 2012 to a mothballed section of the former Varsity Line near Claydon, Buckinghamshire. This followed the government’s announcement that East-West rail link scheme would go ahead. In November 2011 however, the Government announced that the western section from Oxford to Bedford was to be constructed as part of a strategic rail link, East-West Rail (EWR). This would run between the electrified Great Western, West Coast and Midland main lines, including the mothballed section between Claydon, just west of Calvert, and Newton Longville, near Bletchley. The new line, which would be twin tracked, and capable of speeds of 90 to 100 mph, will cost £400, with electrification, and completion is expected in 2017. In five years time then, the view of the line as above will be gone. But this is not the only change that is going to happen at this spot. A single track branch line of the Great Eastern Railway from Audley End to Bartlow via Saffron Walden, a distance of seven and a quarter miles, was opened in 1866. The line went through the village of Ashdon, five miles to the east of Saffron Walden. However, it wasn’t until 1911, following a local campaign that the residents of Ashdon were given a halt, with a platform constructed of raised earth and clinker with a front of old sleepers. In 1916, an old Great Eastern Railway carriage with a largely wooden body, was mounted on the platform as a waiting room. From July 1958, the line was operated by railcars, which were carriages with built-in diesel engines. They were seen as a low-cost solution to keeping open lines with small numbers of passengers, but in 1963 the Beeching Report listed the line for closure. 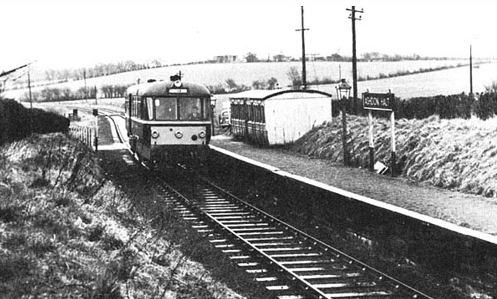 The line was closed to passengers the year after on 7 September 1964, and to freight three months later, and the track was lifted in 1968. Remarkably, the platform and ‘waiting room’ room are still largely intact.